For other uses, see Currency (disambiguation). A currency (from Middle English: curraunt, "in circulation", from Latin: currens, -entis), in the most specific sense is money in any form when in use or circulation as a medium of exchange, especially circulating banknotes and coins. A more general definition is that a currency is a system of money (monetary units) in common use, especially for people in a nation. Under this definition, US dollars (US$), pounds sterling (£), Australian dollars (A$), European euros (€), Russian rubles (₽) and Indian Rupees (₹) are examples of currency. These various currencies are recognized as stores of value and are traded between nations in foreign exchange markets, which determine the relative values of the different currencies. Currencies in this sense are defined by governments, and each type has limited boundaries of acceptance. Other definitions of the term "currency" are discussed in their respective synonymous articles banknote, coin, and money. The latter definition,[clarification needed] pertaining to the currency systems of nations, is the topic of this article. Currencies can be classified into two monetary systems: fiat money and commodity money, depending on what guarantees the currency's value (the economy at large vs. the government's physical metal reserves). Some currencies are legal tender in certain political jurisdictions. Others are simply traded for their economic value. Digital currency has arisen with the popularity of computers and the Internet. Originally money was a form of receipt, representing grain stored in temple granaries in Sumer in ancient Mesopotamia and later in Ancient Egypt. In this first stage of currency, metals were used as symbols to represent value stored in the form of commodities. This formed the basis of trade in the Fertile Crescent for over 1500 years. However, the collapse of the Near Eastern trading system pointed to a flaw: in an era where there was no place that was safe to store value, the value of a circulating medium could only be as sound as the forces that defended that store. A trade could only reach as far as the credibility of that military. By the late Bronze Age, however, a series of treaties had established safe passage for merchants around the Eastern Mediterranean, spreading from Minoan Crete and Mycenae in the northwest to Elam and Bahrain in the southeast. It is not known what was used as a currency for these exchanges, but it is thought that ox-hide shaped ingots of copper, produced in Cyprus, may have functioned as a currency. It is thought that the increase in piracy and raiding associated with the Bronze Age collapse, possibly produced by the Peoples of the Sea, brought the trading system of oxhide ingots to an end. It was only the recovery of Phoenician trade in the 10th and 9th centuries BC that led to a return to prosperity, and the appearance of real coinage, possibly first in Anatolia with Croesus of Lydia and subsequently with the Greeks and Persians. In Africa, many forms of value store have been used, including beads, ingots, ivory, various forms of weapons, livestock, the manilla currency, and ochre and other earth oxides. The manilla rings of West Africa were one of the currencies used from the 15th century onwards to sell slaves. African currency is still notable for its variety, and in many places, various forms of barter still apply. These[clarification needed] factors led to the metal itself being the store of value: first silver, then both silver and gold, and at one point also bronze. Now we have copper coins and other non-precious metals as coins. Metals were mined, weighed, and stamped into coins. This was to assure the individual accepting the coin that he was getting a certain known weight of precious metal. Coins could be counterfeited, but the existence of standard coins also created a new unit of account, which helped lead to banking. Archimedes' principle provided the next link: coins could now be easily tested for their fine weight of metal, and thus the value of a coin could be determined, even if it had been shaved, debased or otherwise tampered with (see Numismatics). Most major economies using coinage had several tiers of coins of different values, made of copper, silver, and gold. Gold coins were the most valuable and were used for large purchases, payment of the military and backing of state activities. Units of account were often defined as the value of a particular type of gold coin. Silver coins were used for midsized transactions, and sometimes also defined a unit of account, while coins of copper or silver, or some mixture of them (see debasement), might be used for everyday transactions. This system had been used in ancient India since the time of the Mahajanapadas. The exact ratios between the values of the three metals varied greatly between different eras and places; for example, the opening of silver mines in the Harz mountains of central Europe made silver relatively less valuable, as did the flood of New World silver after the Spanish conquests. However, the rarity of gold consistently made it more valuable than silver, and likewise silver was consistently worth more than copper. In premodern China, the need for credit and for a medium of exchange that was less physically cumbersome than large numbers of copper coins led to the introduction of paper money, i.e. banknotes. Their introduction was a gradual process which lasted from the late Tang dynasty (618–907) into the Song dynasty (960–1279). It began as a means for merchants to exchange heavy coinage for receipts of deposit issued as promissory notes by wholesalers' shops. These notes were valid for temporary use in a small regional territory. In the 10th century, the Song dynasty government began to circulate these notes amongst the traders in its monopolized salt industry. The Song government granted several shops the right to issue banknotes, and in the early 12th century the government finally took over these shops to produce state-issued currency. Yet the banknotes issued were still only locally and temporarily valid: it was not until the mid 13th century that a standard and uniform government issue of paper money became an acceptable nationwide currency. 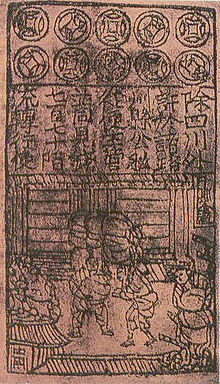 The already widespread methods of woodblock printing and then Bi Sheng's movable type printing by the 11th century were the impetus for the mass production of paper money in premodern China. 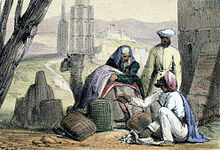 At around the same time in the medieval Islamic world, a vigorous monetary economy was created during the 7th–12th centuries on the basis of the expanding levels of circulation of a stable high-value currency (the dinar). Innovations introduced by Muslim economists, traders and merchants include the earliest uses of credit, cheques, promissory notes, savings accounts, transactional accounts, loaning, trusts, exchange rates, the transfer of credit and debt, and banking institutions for loans and deposits. In Europe, paper money was first introduced on a regular basis in Sweden in 1661 (although Washington Irving records an earlier emergency use of it, by the Spanish in a siege during the Conquest of Granada). As Sweden was rich in copper, many copper coins were in circulation, but its relatively low value necessitated extraordinarily big coins, often weighing several kilograms. The advantages of paper currency were numerous: it reduced the need to transport gold and silver, which was risky; it facilitated loans of gold or silver at interest, since the underlying specie (money in the form of gold or silver coins rather than notes) never left the possession of the lender until someone else redeemed the note; and it allowed a division of currency into credit- and specie-backed forms. It enabled the sale of stock in joint-stock companies and the redemption of those shares in a paper. But there were also disadvantages. First, since a note has no intrinsic value, there was nothing to stop issuing authorities from printing more notes than they had specie to back them with. Second, because it increased the money supply, it increased inflationary pressures, a fact observed by David Hume in the 18th century. Thus paper money would often lead to an inflationary bubble, which could collapse if people began demanding hard money, causing the demand for paper notes to fall to zero. The printing of paper money was also associated with wars, and financing of wars, and therefore regarded as part of maintaining a standing army. For these reasons, paper currency was held in suspicion and hostility in Europe and America. It was also addictive since the speculative profits of trade and capital creation were quite large. Major nations established mints to print money and mint coins, and branches of their treasury to collect taxes and hold gold and silver stock. At that time, both silver and gold were considered a legal tender and accepted by governments for taxes. However, the instability in the exchange rate between the two grew over the course of the 19th century, with the increases both in the supply of these metals, particularly silver, and in trade. The parallel use of both metals is called bimetallism, and the attempt to create a bimetallic standard where both gold and silver backed currency remained in circulation occupied the efforts of inflationists. Governments at this point could use currency as an instrument of policy, printing paper currency such as the United States greenback, to pay for military expenditures. They could also set the terms at which they would redeem notes for specie, by limiting the amount of purchase, or the minimum amount that could be redeemed. By 1900, most of the industrializing nations were on some form of gold standard, with paper notes and silver coins constituting the circulating medium. Private banks and governments across the world followed Gresham's law: keeping the gold and silver they received but paying out in notes. This did not happen all around the world at the same time, but occurred sporadically, generally in times of war or financial crisis, beginning in the early 20th century and continuing across the world until the late 20th century, when the regime of floating fiat currencies came into force. One of the last countries to break away from the gold standard was the United States in 1971, an action known as the Nixon shock. No country has an enforceable gold standard or silver standard currency system. A banknote (more commonly known as a bill in the United States and Canada) is a type of currency and is commonly used as legal tender in many jurisdictions. Together with coins, banknotes make up the cash form of all money. Banknotes are mostly paper, but Australia's Commonwealth Scientific and Industrial Research Organisation developed a polymer currency in the 1980s; it went into circulation on the nation's bicentenary in 1988. Polymer banknotes had already been introduced in the Isle of Man in 1983. Now[when?] used in some 22 countries (over 40 if counting commemorative issues), polymer currency dramatically increases the life span of banknotes and reduces counterfeiting. For a list of which currency or currencies are used by present-day countries or regions, see List of circulating currencies. The currency usage is based on the concept of lex monetae; that a sovereign state decides which currency it shall use. The International Organization for Standardization has introduced a system of three-letter codes (ISO 4217) to denote currency (as opposed to simple names or currency signs), in order to remove the confusion arising because there are dozens of currencies called the dollar and several called the franc. Even the "pound" is used in nearly a dozen different countries; most of these are tied to the Pound Sterling, while the remainder has varying values. In general, the three-letter code uses the ISO 3166-1 country code for the first two letters and the first letter of the name of the currency (D for dollar, for instance) as the third letter. United States currency, for instance, is globally referred to as USD. The International Monetary Fund uses a different system when referring to national currencies. Distinct from centrally controlled government-issued currencies, private decentralized trust networks support alternative currencies such as Bitcoin, Ethereum, Litecoin, Monero, Peercoin or Dogecoin, as well as branded currencies, for example 'obligation' based stores of value, such as quasi-regulated BarterCard, Loyalty Points (Credit Cards, Airlines) or Game-Credits (MMO games) that are based on reputation of commercial products, or highly regulated 'asset-backed' 'alternative currencies' such as mobile-money schemes like MPESA (called E-Money Issuance). The currency may be Internet-based and digital, for instance, bitcoin is not tied to any specific country, or the IMF's SDR that is based on a basket of currencies (and assets held). In most cases, a central bank has a monopoly right to issue of coins and banknotes (fiat money) for its own area of circulation (a country or group of countries); it regulates the production of currency by banks (credit) through monetary policy. An exchange rate is a price at which two currencies can be exchanged against each other. This is used for trade between the two currency zones. Exchange rates can be classified as either floating or fixed. In the former, day-to-day movements in exchange rates are determined by the market; in the latter, governments intervene in the market to buy or sell their currency to balance supply and demand at a static exchange rate. In cases where a country has control of its own currency, that control is exercised either by a central bank or by a Ministry of Finance. The institution that has control of monetary policy is referred to as the monetary authority. Monetary authorities have varying degrees of autonomy from the governments that create them. A monetary authority is created and supported by its sponsoring government, so independence can be reduced by the legislative or executive authority that creates it. Several countries can use the same name for their own separate currencies (for example, a dollar in Australia, Canada, and the United States). By contrast, several countries can also use the same currency (for example, the euro or the CFA franc), or one country can declare the currency of another country to be legal tender. For example, Panama and El Salvador have declared US currency to be legal tender, and from 1791 to 1857, Spanish silver coins were legal tender in the United States. At various times countries have either re-stamped foreign coins or used currency board issuing one note of currency for each note of a foreign government held, as Ecuador currently does. Each currency typically has a main currency unit (the dollar, for example, or the euro) and a fractional unit, often defined as ​1⁄100 of the main unit: 100 cents = 1 dollar, 100 centimes = 1 franc, 100 pence = 1 pound, although units of ​1⁄10 or ​1⁄1000 occasionally also occur. Some currencies do not have any smaller units at all, such as the Icelandic króna. When there are no restrictions or limitations on the amount of currency that can be traded on the international market, and the government does not artificially impose a fixed value or minimum value on the currency in international trade. The US dollar is an example of a fully convertible currency and, for this reason, US dollars are one of the major currencies traded in the foreign exchange market. Central banks control international investments flowing into and out of a country. While most domestic transactions are handled without any special requirements, there are significant restrictions on international investing, and special approval is often required in order to convert into other currencies. The Indian rupee and the renminbi are examples of partially convertible currencies. A government neither participates in the international currency market nor allows conversion of its currency by individuals or companies. These currencies are also known as blocked, e.g. the North Korean won and the Cuban peso. In economics, a local currency is a currency not backed by a national government and intended to trade only in a small area. Advocates such as Jane Jacobs argue that this enables an economically depressed region to pull itself up, by giving the people living there a medium of exchange that they can use to exchange services and locally produced goods (in a broader sense, this is the original purpose of all money). Opponents of this concept argue that local currency creates a barrier which can interfere with economies of scale and comparative advantage and that in some cases they can serve as a means of tax evasion. Local currencies can also come into being when there is economic turmoil involving the national currency. An example of this is the Argentinian economic crisis of 2002 in which IOUs issued by local governments quickly took on some of the characteristics of local currencies. One of the best examples of a local currency is the original LETS currency, founded on Vancouver Island in the early 1980s. In 1982, the Canadian Central Bank’s lending rates ran up to 14% which drove chartered bank lending rates as high as 19%. The resulting currency and credit scarcity left island residents with few options other than to create a local currency. The following table are estimates of the 15 most frequently used currencies in world payments from 2012 to 2018 by SWIFT. ^ "Currency". The Free Dictionary. ^ Bernstein, Peter (2008) . "4–5". A Primer on Money, Banking and Gold (3rd ed.). Hoboken, NJ: Wiley. ISBN 978-0-470-28758-3. OCLC 233484849. ^ "Guide to the Financial Markets" (PDF). The Economist. ^ Banaji, Jairus (2007). "Islam, the Mediterranean and the Rise of Capitalism". Historical Materialism. 15 (1): 47–74. doi:10.1163/156920607X171591. ISSN 1465-4466. OCLC 440360743. Archived from the original on May 23, 2009. Retrieved August 28, 2010. ^ Lopez, Robert Sabatino; Raymond, Irving Woodworth; Constable, Olivia Remie (2001) . Medieval trade in the Mediterranean world: Illustrative documents. Records of Western civilization. ; Records of civilization, sources and studies, no. 52. New York: Columbia University Press. ISBN 978-0-231-12357-0. OCLC 466877309. Archived from the original on March 9, 2012. ^ a b Labib, Subhi Y. (March 1969). "Capitalism in Medieval Islam". The Journal of Economic History. 29 (1): 79–86. ISSN 0022-0507. JSTOR 2115499. OCLC 478662641. ^ "Triennial Central Bank Survey Foreign exchange turnover in April 2016" (PDF). Triennial Central Bank Survey. Basel, Switzerland: Bank for International Settlements. December 11, 2016. p. 7. Retrieved March 22, 2017. ^ ● TED Video: Kemp-Robertson, Paul (June 2013). "Bitcoin. Sweat. Tide. Meet the future of branded currency". TED (conference). ● Corresponding written article: "10 alternative currencies, from Bitcoin to BerkShares to sweat to laundry detergent". TED (conference). July 25, 2013. Archived from the original on July 25, 2013. ^ Hough, Jack. "The Currency That's Up 200,000 Percent". SmartMoney (The Wall Street Journal). Archived from the original on October 24, 2012. Retrieved December 14, 2012. ^ Turk, James; Rubino, John (2007) . The collapse of the dollar and how to profit from it: Make a fortune by investing in gold and other hard assets (Paperback ed.). New York: Doubleday. pp. 43 of 252. ISBN 978-0-385-51224-4. OCLC 192055959. ^ Linton, Michael; Bober, Jordan (November 7, 2012). "Opening Money". The Extraenvironmentalist (Interview). Interviewed by Seth Moser-Katz; Justin Ritchie. Retrieved December 29, 2016.